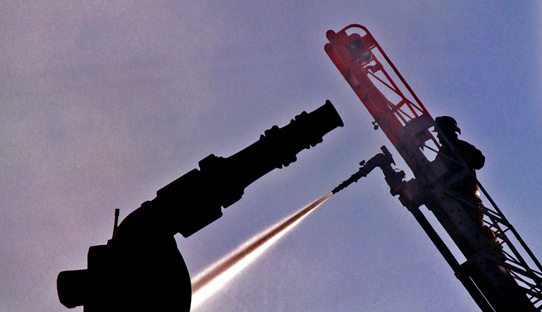 Welcome to the “Fire Service” page of CtCameraEye! 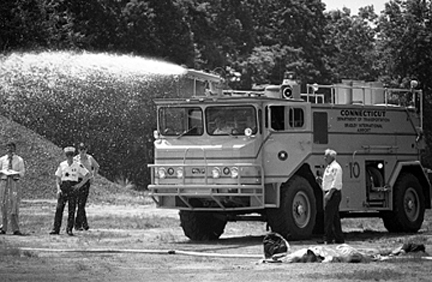 Here is where I will try to showcase past memories and images of the fire service. The most recent postings that I do will be at the top of the page just under this message. 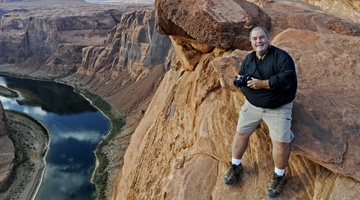 Feel free to scroll down to find some memoriable pictures that I have taken for the past 35+ years, or pictures that I have obtained and would be of interest to you. Take your time, relax, and enjoy! 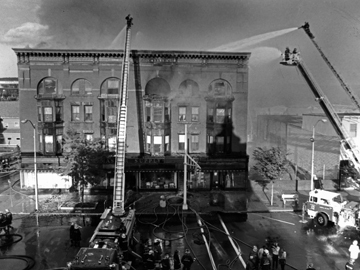 On a cold winter day this general alarm fire on Main Street brought in mutual aid from Kensington and Newington to use there Snorkel Trucks. 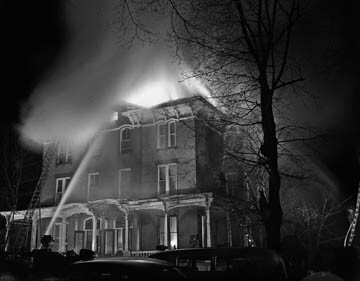 A cold January evening to fight this “H” shaped apartment house fire. Quickly going to 3 alarms firefighters fought this one all night until there was nothing left but the cellar after the building collapased. A quick moving fire fueled by 2000 gallons of diesel destroyed this trucking company in the Milldale section of Southington. Mutual aid from surrounding towns responded to the scene and brought the fire under control in just over an hour. Here are some shots I took while doing some video for work. It’s getting cold outside, so it’s time to get going and start filing and archieving some more fire images. 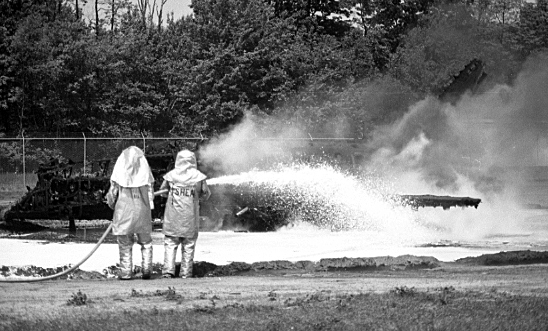 Here are some shots that I recently found of a burn drill I attended back in 1984 put on by the Bradley Airport Fire Department. Those were the days when the columns of black smoke could be seen quite often near the airport. 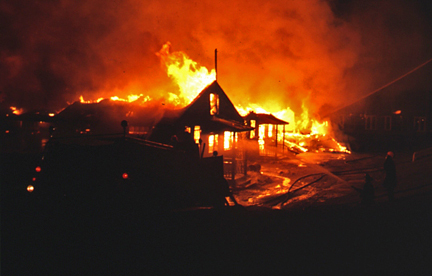 This major fire on a cold winter afternoon destroyed a factory complex in the center of town, and the Lyon and Billard Lumbyard that it was adjacent to. The smoke could be seen as far as Massachusetts, while hundreds of firefighters fought the fire into the night. In the images I took below is Kensington Fire Departments Snorkel 4 as it is in the middle of the lumberyard fighting the fire. 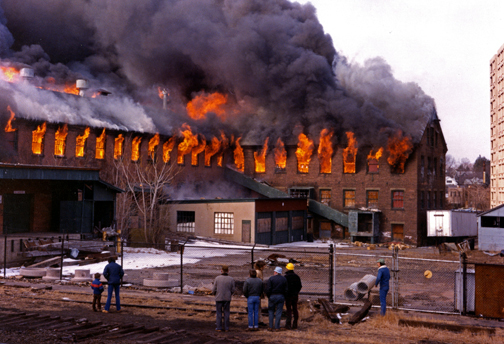 A 10 alarm fire destroyed the Ashland Textile Mill complex bringing more than 500 firefighters from 40 companies to fight the blaze on a Sunday afternoon. I remember responding to this from from Rocky Hill, and seeing the smoke from Colchester. A lot of film was shot at this one! 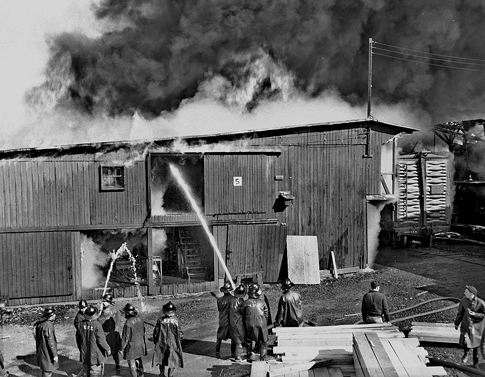 I retouched this photo that I got of the Lowenthan Lumberyard fire in 1957. That’s all it said written on the back of the picture. Looks like a good sized fire going. Any information on this one out there? I did not find anything on the internet about the fire. 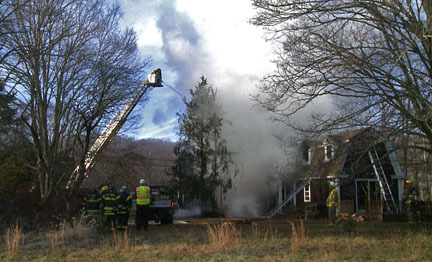 Here is a house fire on Beaver Brook Rd. An apparent electrical fire destroyed most of this unoccupied summer home just after 7:00am. Shooting from a great vantage point of a close by overpass, I captured the images of Meriden Firefighters fight a tanker fire on I-91 between exits 15 -16. Here’s one I found way back in my negative files. It’s of a General Alarm fire in Vernon Circle of the Foodliner Supermarket. In the shot is South Windsor’s Snorkle at work. That was a cold night! 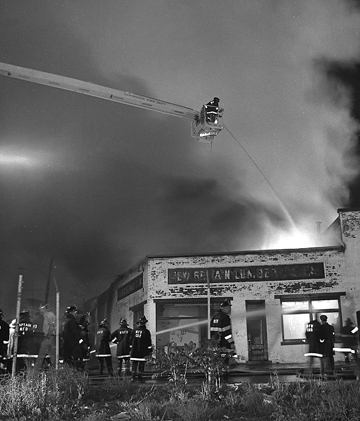 I cleaned up this image that I recently found of a fire at the famous Frank’s Restaurant on Asylum Street in Hartford, Ct. From the little information I found this went to a third alarm. 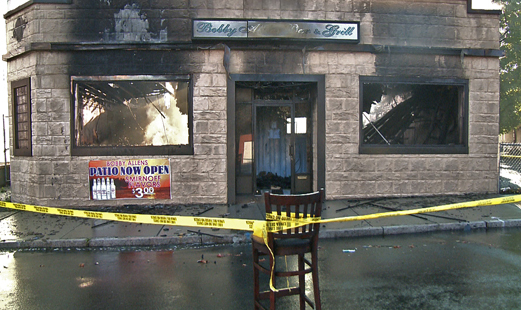 An early morning fire guts the Bobby Allen’s Bar and Grill on Bank Street. This is the first fire in Waterbury I have caught in a long time! 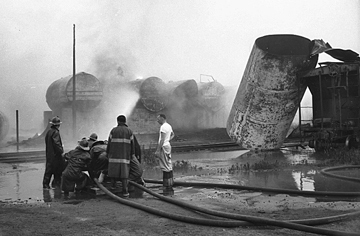 New Years rings in with a General Alarm fire at the Silver Factory. 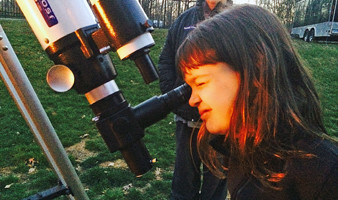 This shot made the front page of the Meriden Record Newspaper. 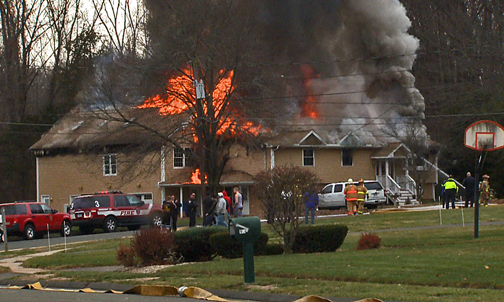 A fully involved house on Cherry Street goes to a third alarm. 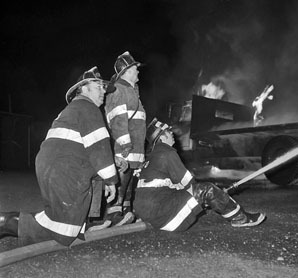 I recently found a few images that a Deputy Chief of New Britain FD gave me many years ago. 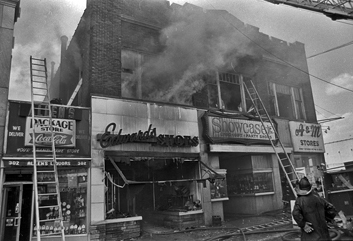 It’s from just one of many fires that devestated downtown New Britain in the 1970’s and 80’s. This one is on Main Street. 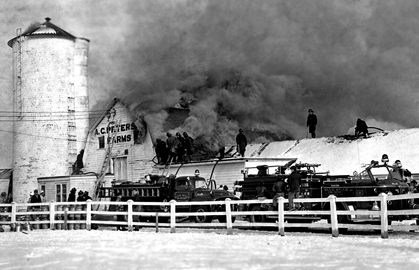 A fire that totally destroyed a landmark in Middlefield. It burned for hours before it totally involved the whole structure. 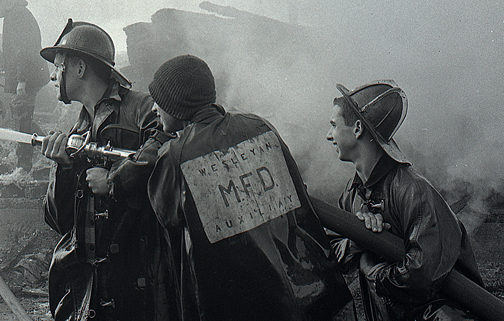 One of the first fires that I shot both color slide film and black and white film. I do not know much about these photos except they were taken at the Phillips Brothers Fuel Company fire in Portland, Ct. From the looks of the pictures it looks like it burned for at least a day if not more. 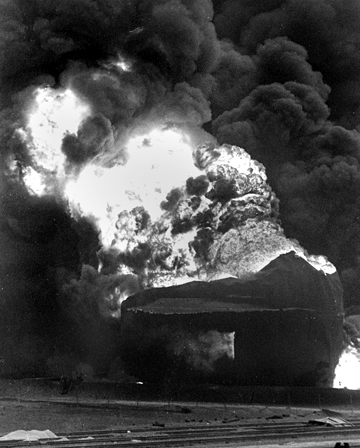 Notice the fountain of fire going quite the distance into the air, and the debris of a oil tank explosion next to a train car. Any information about this fire is certainly appreciated so I may add it to my file on the fire. 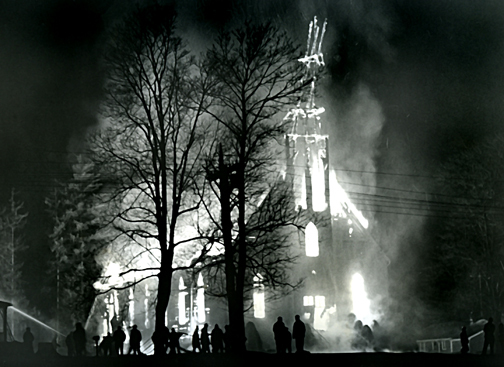 A General Alarm Fire destroyed a 200 year old church in the town’s center. 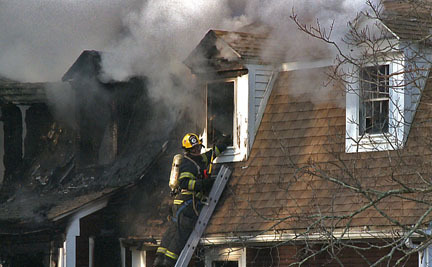 More than 80 firefighters from 5 fire companies battled the blaze for more than 3 hours to bring the fire under control. 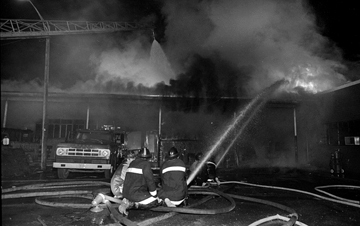 This was one of the first fires that I started shooting with black and white medium format film. 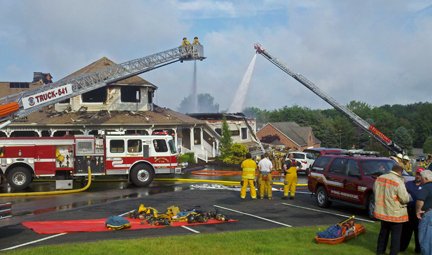 Firefighters from Unionville, Plainville, and Farmington battle an early morning blaze that destroyed a building at the Forest Office Park on Rt. 4. One firefighter was hurt, and seven businesses in the building were lost. Temperatures were well below zero when I was taking these images. A record of -14 degrees was recorded at Bradley Airport that morning. 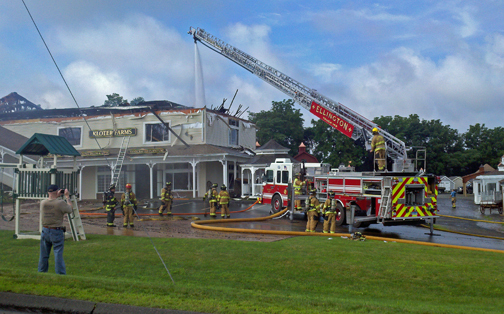 A landmark family owned business in the town of Ellington went up in flames during a 3 alarm fire at about 7:00am. 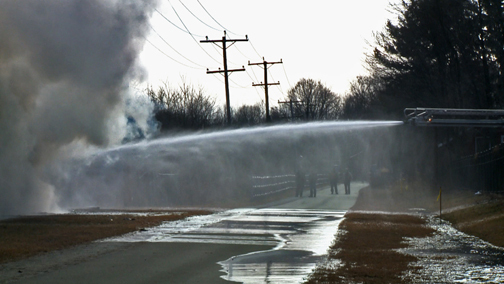 Firefighters from six surrounding towns provided mutual aid during the firefighting effort. I got to the scene within 35 minutes of the first alarm and the roof had already been burned off and the fire contained. This one was a tough one to clean up and get into a condition to reproduce into a good image. Found totally stuck together inside pages of a book, it took about 11 hours to salvage these negatives over a period of a month. I have no information about this fire other than it was an Oil Tank fire owned by the Crown Company. Probably on the Connecticut River over 50 years ago. To start figuring out where the fire was located, I started enlarging the firefighters coats to see where they were from. Then took the information and started working backwards in time to figure out the rest of the little information I have. Here’s a elargement of the firefighters coats that I started with. Not much to work with, but just enough for a lead. 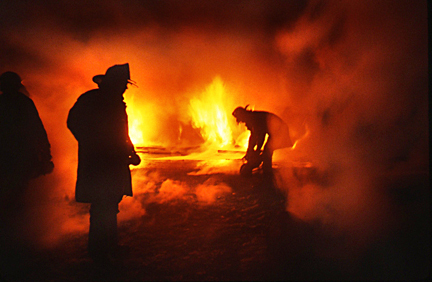 A 3rd alarm warehouse fire in sub freezing temperatures at the corner of Forbes and Church Streets. 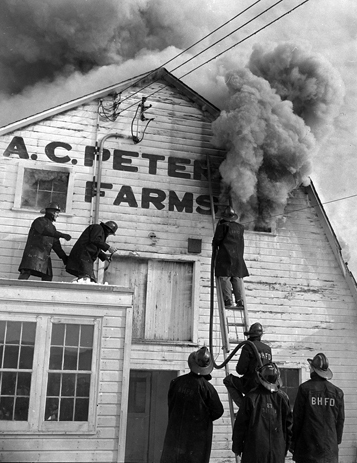 A.C. Peterson barn fire in Bloomfield, Connecticut. 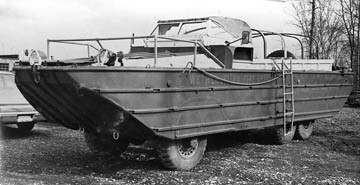 An amphibious craft nicknamed “The Duck” used in WW II is shown here just before it was sold at public auction in Wethersfield. 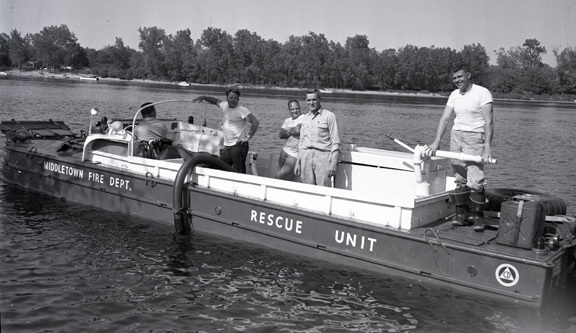 The fire department had used the vehicle since 1953 responding to calls in the Wethesfield Cove, and the Connecticut River. Newington firefighters used an aerial ladder to perform more than 100 evacuations in freezing temperatures during a fire shortly after 4:40am. 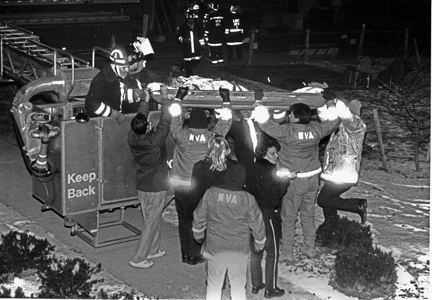 These images that I took, were featured in an in depth article about the fire by Richard Scialabba, in the April 1991 issue of Firehouse Magazine. 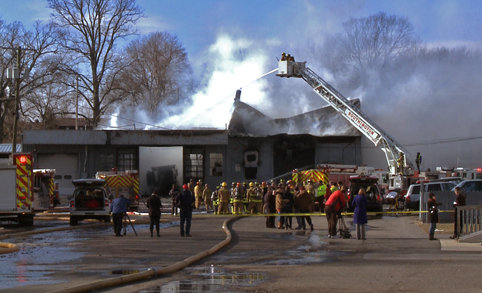 More that 150 firefighters battled a blaze at the Master Supply & Hardware Store on Main Street in Middletown. 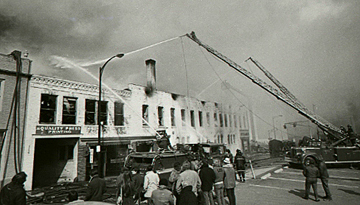 Thousands of onlookers watched on a Sunday afteroon as fire spread throughout the 4 story brick building. 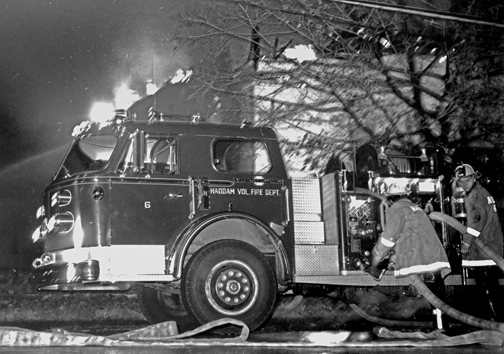 Here are several pictures from my collection of New Britain firefighters at a nightime building fire on Main Street in sub-freezing temperatures. I do not have much information on this General Alarm other than it did call in mutual aid from surrounding towns. 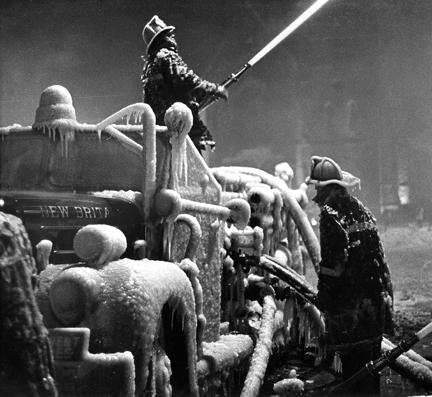 It was a cold night for sure for those firefighters! 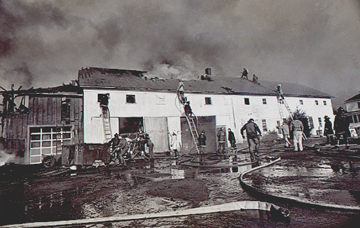 In one of the most spectacular fast moving fires that I have ever seen, the oil soaked floors of Factory “H” of the International Silver Company went from smoke showing, to a wall of fire in just minutes. I was enroute to a job interview at 9:00am and decided to check it out. I am glad I did. Oh, by the way I never did go to that job interview. It’s hard to believe it was 31 years ago! 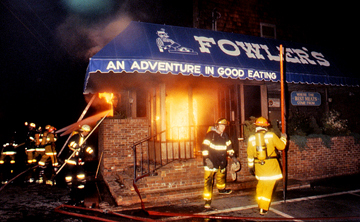 An early morning fire that began in a storage closet destroyed Testa’s Restaurant at 466 South Broad Street. More than 50 firefighters from Wallingford and Meriden fought the blaze for more than 5 hours before bringing it under control. 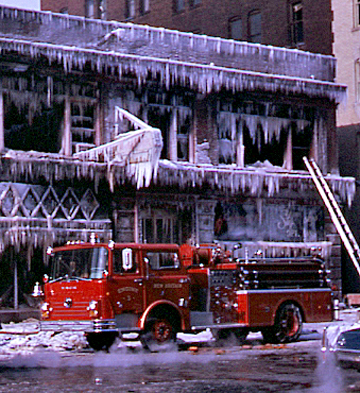 It was a cold January morning when I happened to catch this 5th alarm in an “L” shaped, 11 story apartment house. Earlier in the evening I was riding with Engine 75 in the Bronx till about 3am, catching 4 working fires, 2 second alarms, and a 5th alarm in Manhatten. I was tired. I had plenty of pictures, and was almost out of film. Yup, film. Remember those days? I said goodbye to my friends on Jerome Ave and started to head home. Before I left one of the guys in the firehouse said they had a 2nd going in Queens and knew the building. ” It will go a lot higher in that building”, he said and told me to head toward it to get some good shots. A half hour later I arrived at the scene, now a 4th alarm, with heavy fire in one third of the apartment building. Talking with the driver of the Assistant Chief on the scene, he “suggested” where I should go for some good shots. Walking up 11 stories to the roof was no easy task, even back then. The driver told the crew I was was coming up and greeted me at the door. After that it was a great experience with these guys shooting them cutting roof cuts for about a half an hour, stopping the fire from spreading throughout the building. They even gave me the saw for a few 10 foot cuts myself! Flames coming out of the cuts I was making trying to beat the fire, I was in heaven on that roof! Here’s one the best shots of the roof crew! Thanks guys! I won’t forget the experience! 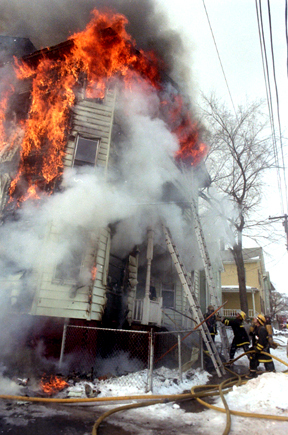 Those were the days where we would go out and chase down 10, 15, 20 working fires throughout Providence. Here’s just one that we just happened upon. An easy 2nd alarm, but the dispatcher said “handle it yourself, the city is out of equipment.” One engine, 15 fire buffs, and a lot of great pictures! 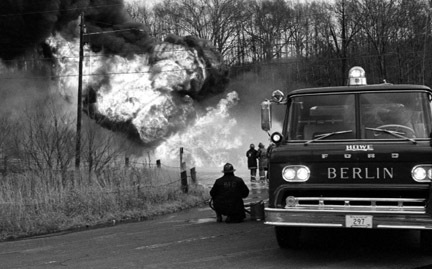 A tanker truck rolled over and caught fire in mid afternoon on the Berlin Turnpike, near where the Hawthorne Inn is located today. 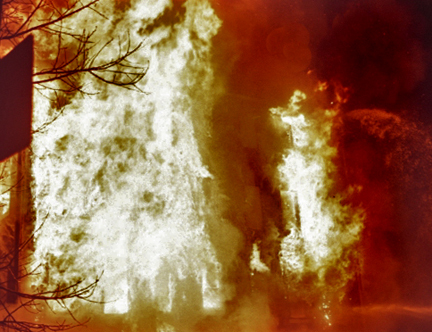 This is one of the first fire images that I photographed in Berlin. Little did I know then, that these images would start me off on a career of a photojournalist. 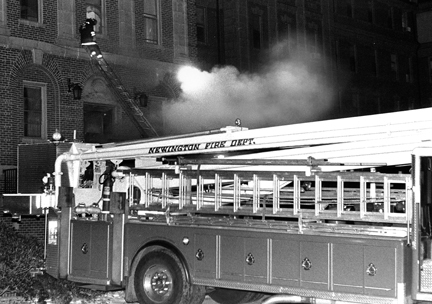 Two years later I joined the South Kensington Fire Department in 1976. 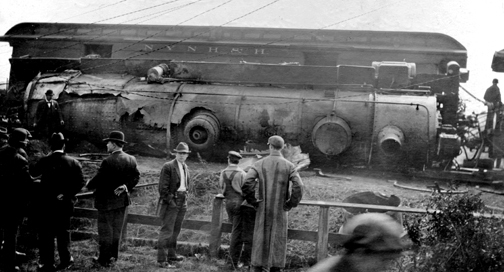 Twelve people were killed, and 150 other passengers were injured when a train called the “Federal Express” derailed at Fairfield Street overturning onto a stone embankment at 50 MPH. Among the injured were several players of the St. Louis National League Baseball Team. 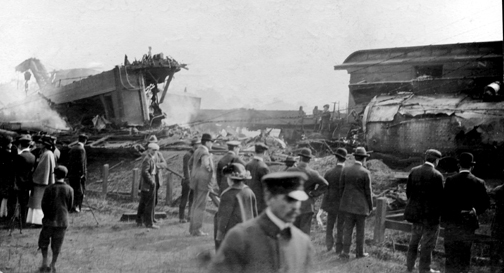 The time of the accident was put at 3:30am while the train was trying to make up for lost time. These are several pictures that I purchased at a flea market of the incident. 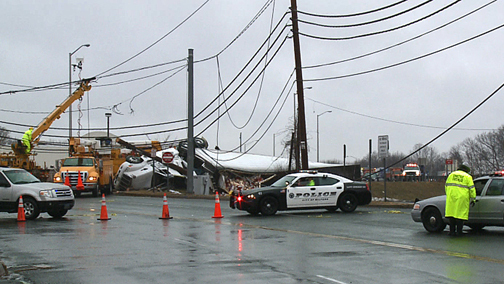 Yet another disaster that Connecticut has lived through, but long forgotten. 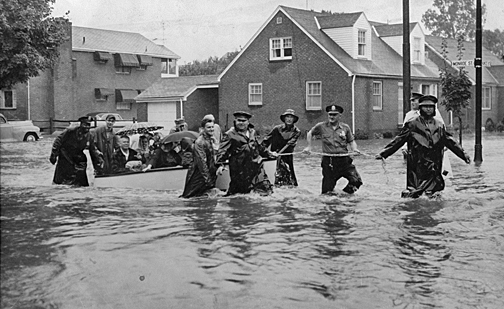 Here’s a image during the 1955 flood of New Britain’s finest making a rescue of a family on the corner of Monroe and Vance Streets. The fire department was answering hundreds of other calls off over the city. 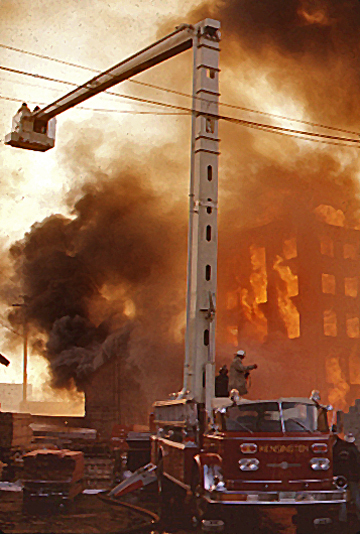 It was an “all call” for all available fire and police to reprt back to work for days on end during this disaster. 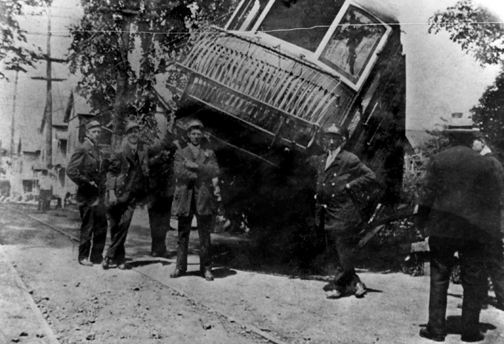 100 Year Old Accident photograph from New Britain, Ct. 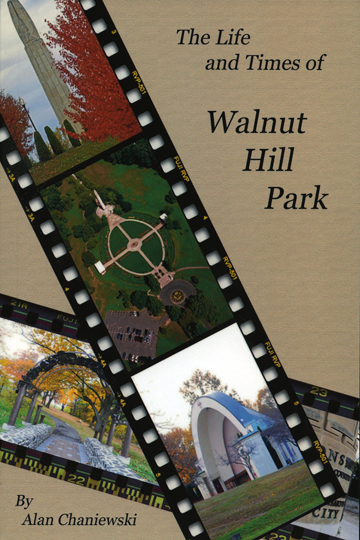 I recently finished cleaning up an old New Britain photograph that I had rescued from certain destruction. After some research, I found out it was a trolly that had jumped it’s tracks at the corner of Arch Street and Rockwell Ave. in 1910. A mere 100 years ago! I would like to know who was chasing fires and accidents so may years ago. 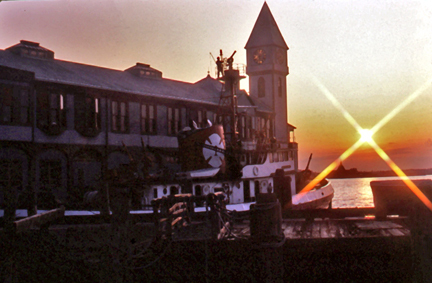 During one of the first bus trips that the Connecticut Fire Photographers Association ever went to was to New York City and “Pier A” in May of 1983. 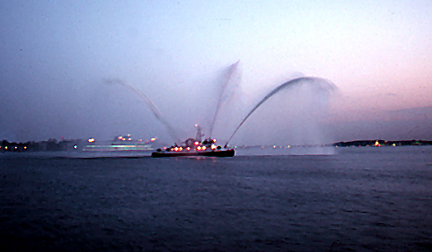 A wonderful tour of the fireboat and pier concluded a full day of activites in and around FDNY’s firehouses. Here are several pictures of the final stop. The firefighters even took the boat out and shot a little water for us! Those were memorable days. 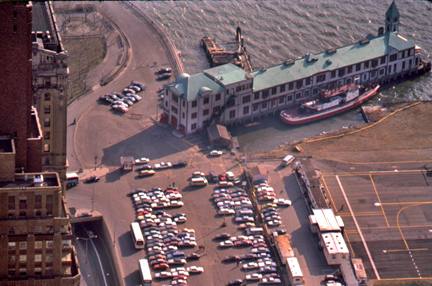 Here is another view of the fire boat house in April 1985. Guess where this was taken from. One last fact. 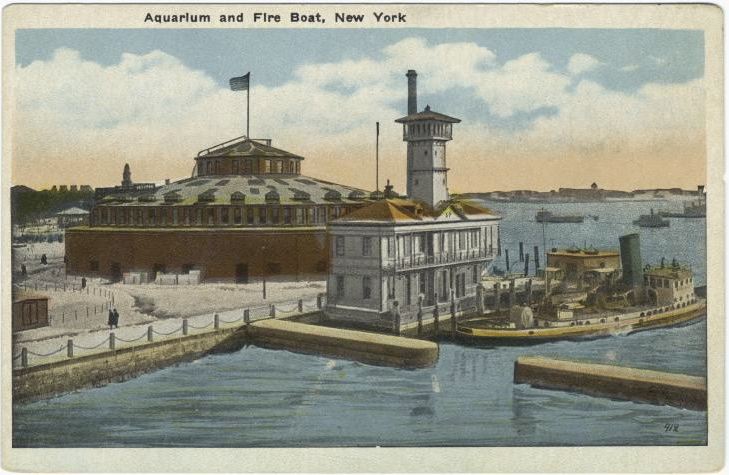 Did you know that “Pier A” housed the New York City Aquarium? Here’s proof from an old post card from 1900. Bet you didn’t know that! The aquarium remained there till 1941. 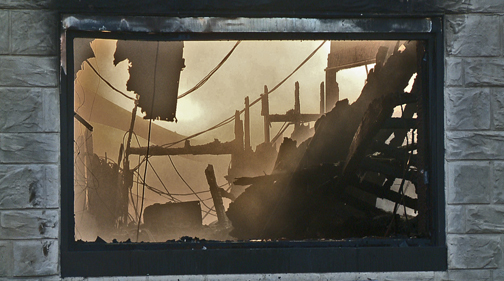 Twenty four people were left homeless after a fire destroyed this 3 story apartment house. Arson is suspected in the fire that burned out of control for several hours before it was brought under control. 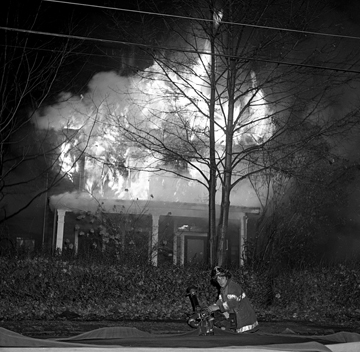 Southington, Ct. – Thanksgiving Day fire – Sabina Dr. While coming back from covering another fire in Oxford, Ct. I noticed a thick column of black smoke from I-84 in Waterbury. I made my way to the scene in about 10 minutes. These are the first images I managed to capture of the fully involved house in this residential neighborhood at about 1:00pm. Lucky for all of us it is a rare oppertunity to respond to an aircraft fire where the craft is really on fire. Such was the case on this cloudy cool day back in 1991. 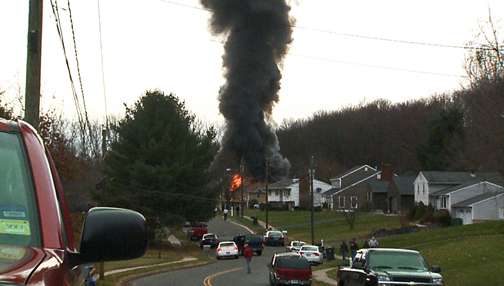 This is only one of maybe two or three aircraft fires that I have ever witnessed. Here’s what happened. 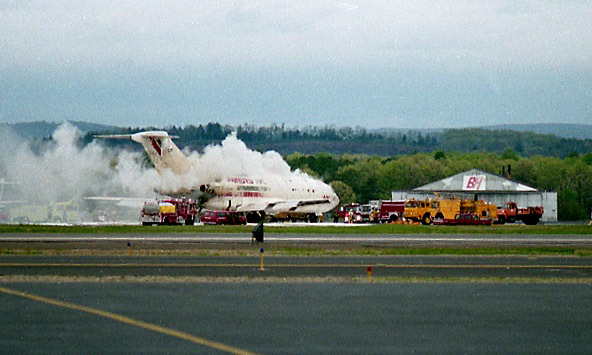 A Ryan 727, N425EX, caught fire during take-off. 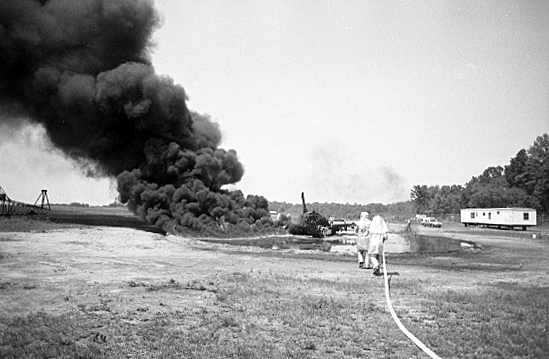 The take-off was aborted and the three crew members escaped, while the aircraft was destroyed by the fire. 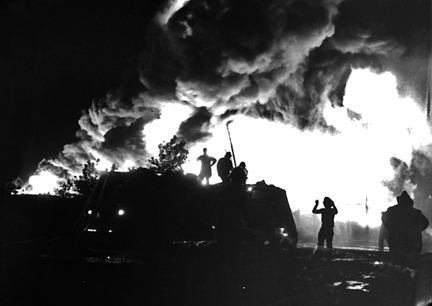 The fire was determined to have started in the number 3 engine. It was determined that the 9th stage HP compressor had ruptured. 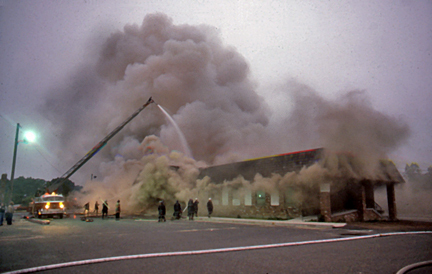 I remember it was a cold windy night when this fire in the south end of New Britain went to a General Alarm. 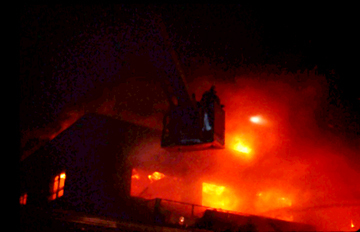 For several hours the fire extended from store to store, finally destroying most of the shopping center. 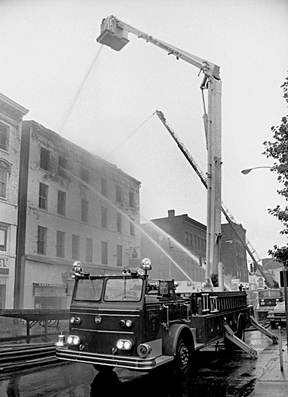 Kensington Fire Department’s Snorkel Truck got called in to the scene later in the fire to extinquish the flames in a two story part of the plaza. 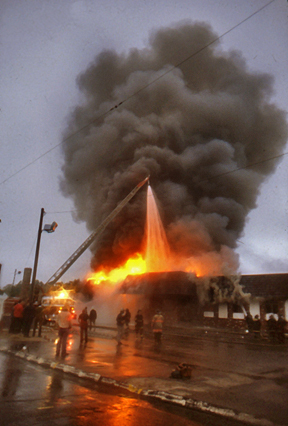 Just one of many fires at the Glen Main Hotel on Main Street that I have covered over the years. This time the fire burned for so long, I managed to fly over it and get some aerial pictures of it. My negative restoration project continues, slow but sure, as time allows. 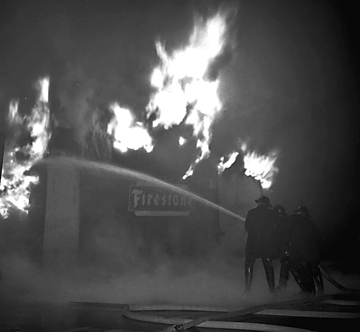 Here is one I just completed from a building fire (Firestone Store) at the corner of Albany and Woodland in Hartford that went to a 3rd alarm back in 1962. It was a typical hot humid summer evening when all hell broke loose on Christian Lane. Pandolf’s junk yard, a well know place that held acres and acres of cars, also held years and years worth of tires, thousands and thousands of tires. Now they were on fire. 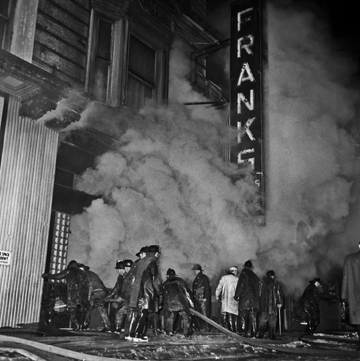 Here are several images that I took that night, as the fire burned out of control for several days. 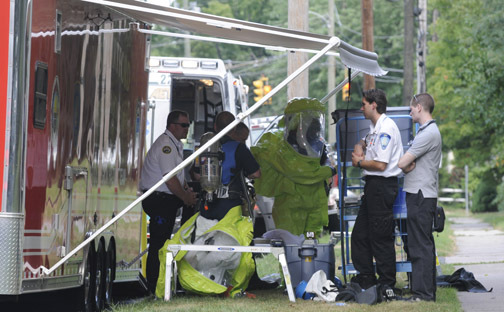 An antique refrigerator being moved caused an unknown chemical to be released resulting in a hazardous materials response from the towns fire department at approximately 11:00 am. 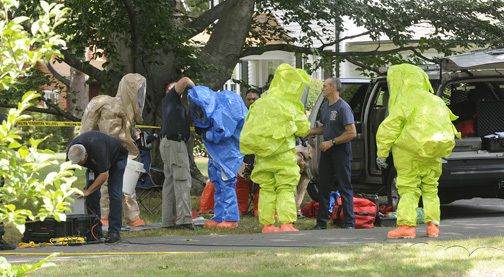 After an additional response by the State DEP, and the West Hartford Fire Department’s Haz Mat team. 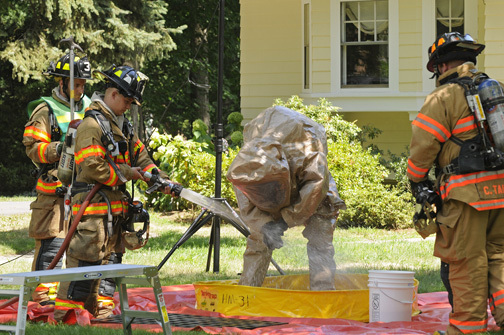 No injuries were reported at the scene at 570 Wolcott Hill Road, and the chemical was identified as sulfur dioxide. Here are a few images from the incident. West Hartford’s team gets suited up. State of Connecticut DEP gets ready for entry into the house. A precautionary was down after entry. 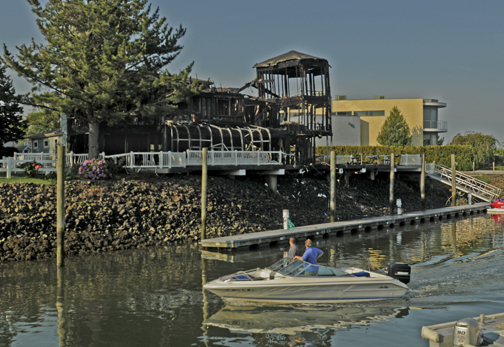 A fire reported at 7:35 pm across from the Pilot’s Point Marina destroyed a large house sending more than 70 firefighters from Westbrook, Clinton, Essex, Old Saybrook and Deep River on June 27. 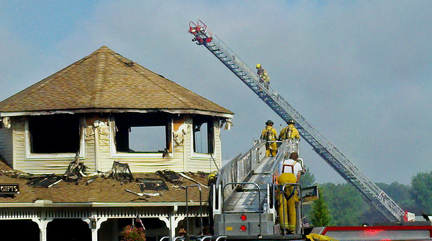 The residence on Captain’s Dr. was unoccupied at the time of the fire. Firefighters took just over an hour to bring the fire under control with the assistance to two fire boats. Here is an image of what is left of the home, from Pilot’s Point Marina. 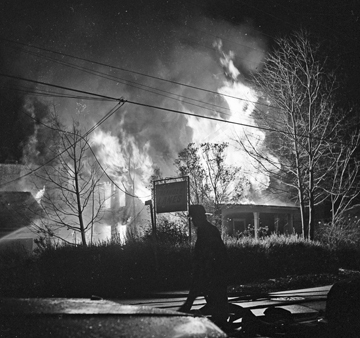 For the past 6 months or so I came across a photo of a fire in Meriden, Ct. that was back in 1964 that I could not find any information about. Thanks to a good friend and firefighter Scott Harris the fire was identified, and a piece of firefighting history is saved. 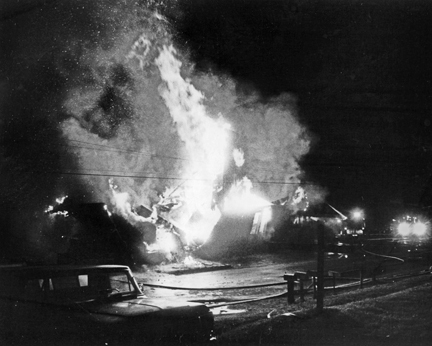 Thanks for all the time you put into finding the information on this huge blaze in Meriden on April 26, 1964. Here are the particulars from Scott. 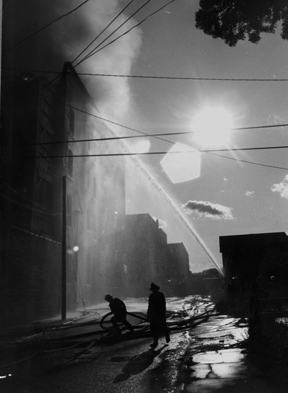 Alarm time was 1521 hrs.The only report of the fire was by street box #49 at High and Charles St (still in service today). 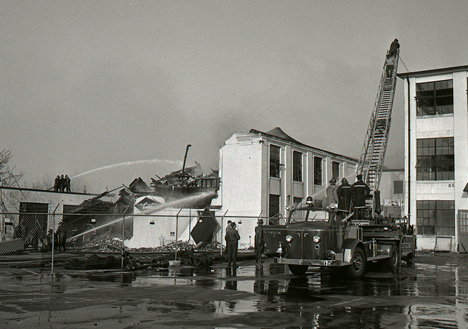 The fire destroyed 3 industrial buildings on Charles Stbetween High and Elm Sts. The buildings were the C.N. Flagg Company, Royal Park Silver Company, and the Esbec Finishing Company. 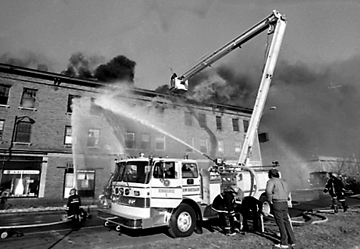 Mutual aid was called into the city from Wallingford, Cheshire, Southington, Berlin, New Britain, Middletown and Waterbury. 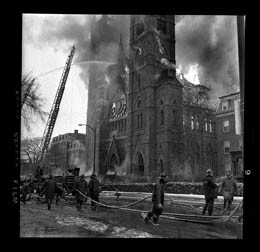 I don’t know much about this early morning fire at the St. John’s Catholic Church, except for the date of March 3, 1953. I was at a town wide tag sale today in Colchester when my eye spotted something. 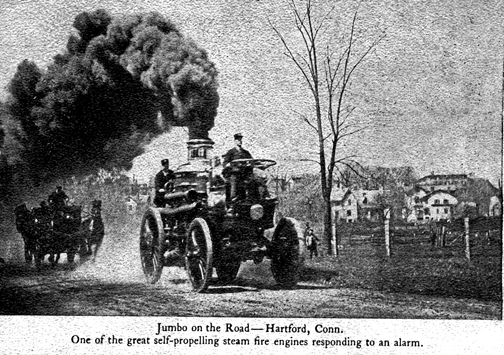 A post card of Hartford, Connecticut’s fire department horseless carriage called “Jumbo”. Bought in 1889 it had a top speed of 10 MPH. 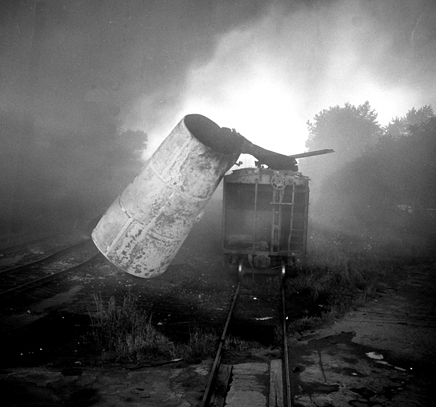 One more interesting fact is that the first driver Jumbo was killed after he fell off and was crushed to death. The postmark on the back was from 1906. Needless to say I bought the card. 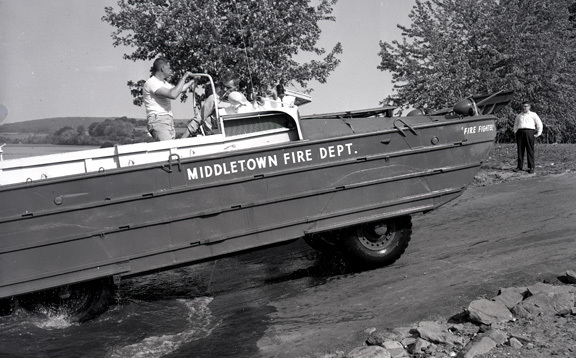 Another interesting set of photos I have run across in the pile of “Middletown” fire service images and negatives that I am going through show what Middletown Firefighters had to manage emergencies on the Connecticut River. The Fire Department Duck. I never knew that they had one, and was quite surprised when I ran across this evidence of it’s existance. 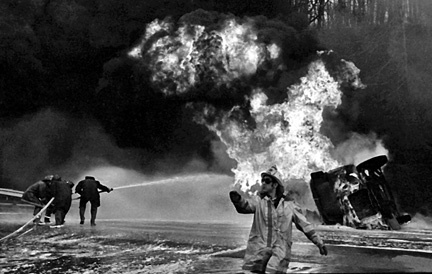 I had a few hours this weekend that I devoted to going through my fire photo collection when something caught my eye. 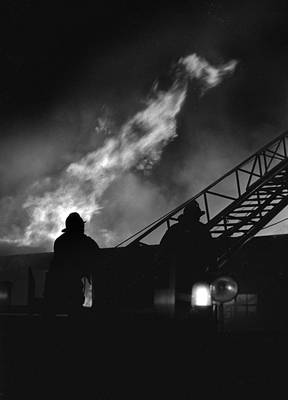 I have several 2 1/4″ x 2 1/4″ negs of a lumberyard fire in Middletown in 1957. 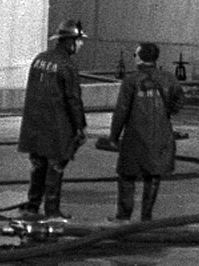 While looking at them I noticed an extremly large identifying letters of the Middletown Fire Department (MFD) on the back of some of the firefighters rubber coats. That is “some”, not all. After blowing up the images I was amazed to find that Middletown had an auxillary in which they callled out in case of major incidents. You will never guess who they are though……Look at the bottom photo! The Middletown Fire Department’s Auxilary was from Wesleyan University! Imagine that in this day and age? 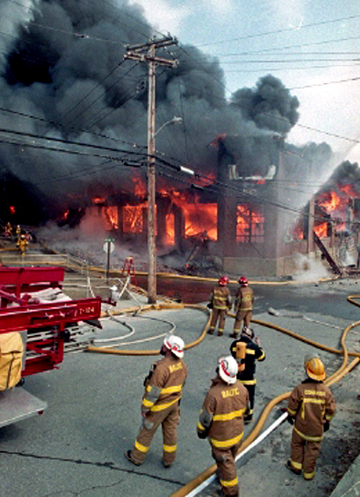 Hartford, Connecticut has had it’s share of tragic medical facility fires. 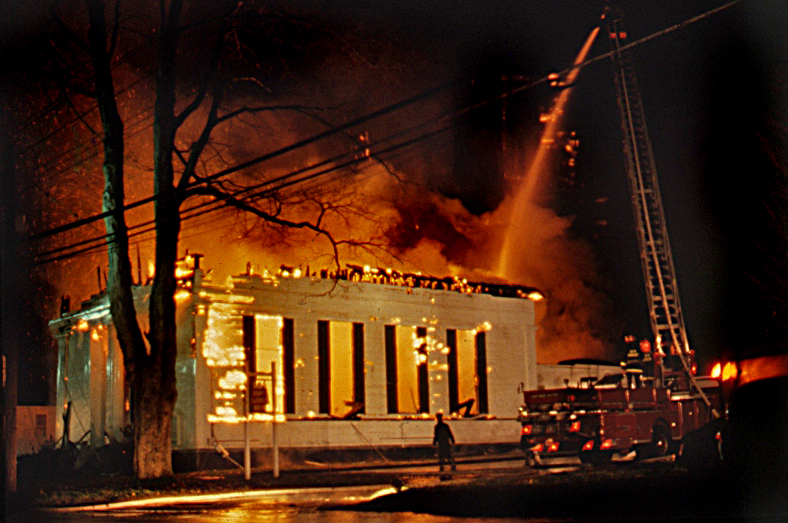 Most recently the Greenwood Health Center fire on February 26, 2003 where 16 people lost their lives. 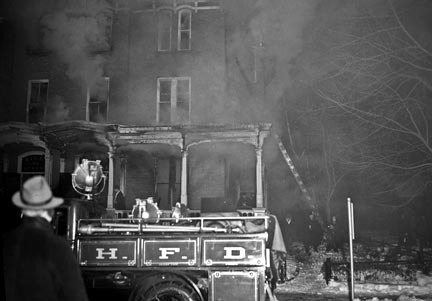 On December 8, 1961 Hartford Hospital had a fire which caused 9 people to lose their lives. Both of these fire were in our generation. Memories are still fresh. Families still remember the day they lost loved ones. 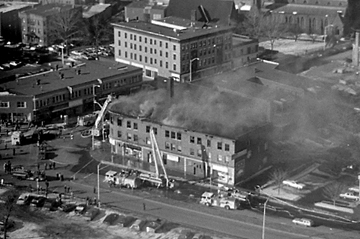 There is another Hospital Fire that not many people even know about that happened in Hartford. 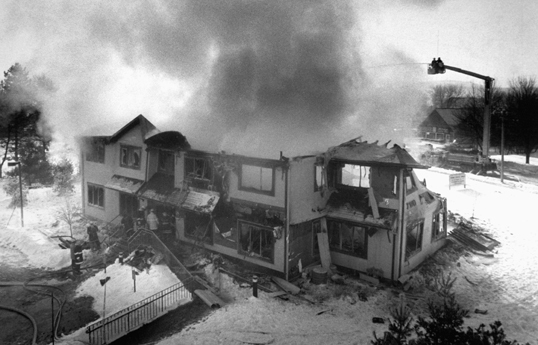 A fire that killed 21 people, and injured 26. Another fire that happened in the winter. 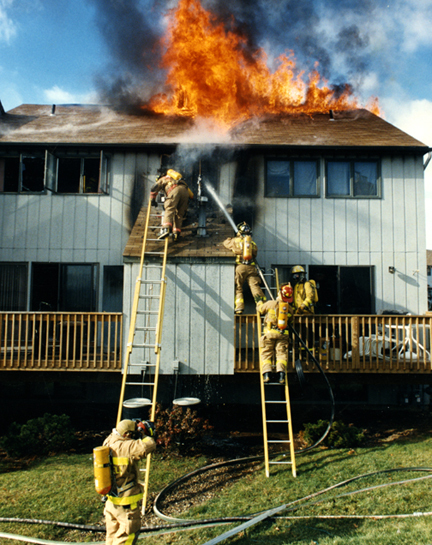 Another fire that was avoidable. 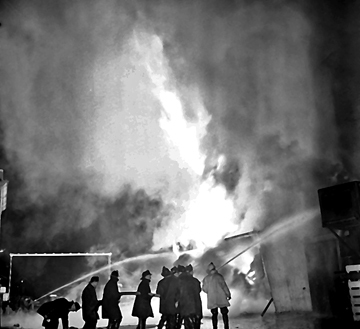 Here’s a short history, and some rare photographs that I have restored about the Niles Street Hospital Fire, December 6, 1945. 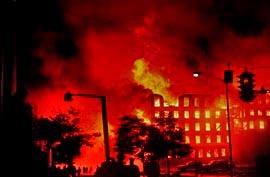 Hartford, Conn. (AP) — Seventeen people are dead following a tragic fire at the Niles Street Hospital which also sent 26 others, including 10 firemen to area hospitals. An investigation by the State Fire Marshal said that the blaze resulted from a short circuit that ignited cotton decorations on a Christmas tree on the first floor. 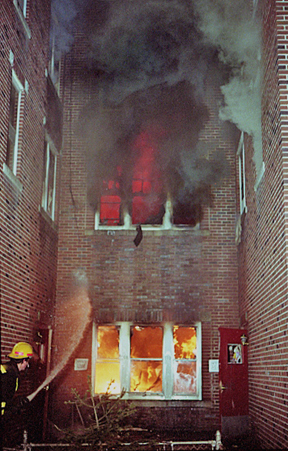 The blaze spread quickly when the front door was opened to guide the patients out of the building. Firemen working in near zero temperatures were unable to check the spread of the fire from the converted brick duplex three story structure. Here are some photos from that night, totally restored and now archieved for future generations to see. The driver of the tractor trailer rig that rolled over on exit 40 in the northbound lane of I-95 was taken to Yale-New Haven Hospital in serious condition. He was extricated by the Milford Fire Department after the 3:12 am accident which brought power lines down causing power outages in the area. The tractor trailer was carrying Clementine Oranges. 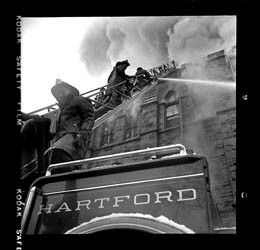 I recently showed some photographs from negatives (that I rescued) at the Connecticut Fire Photographers Christmas Dinner. The images that were found dirty and moldy, were doomed to the trash. After bringing them to a company that freeze dries just about anything to perserve them, I brought them home and started to start the long task of preserving them for future generations. 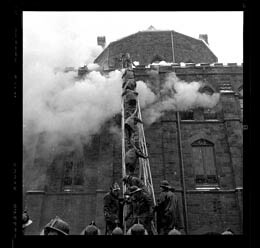 Here is a few examples that I have completed of the historical Hartford Cathedral Fire of 1958. The task is tediously slow, as I might spend up to 4-6 hours cleaning and restoring each negative to the best I can. The results on these 2 1/4″ x 2 1/4 ” pieces of history are unbelievable! 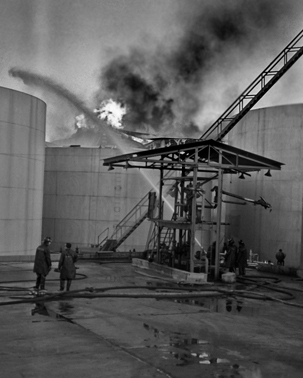 One of the first major fires that I chased out-of-state, was a gasoline storage tank farm fire that killed one man, injured 21 others, and rattled windows in three states. 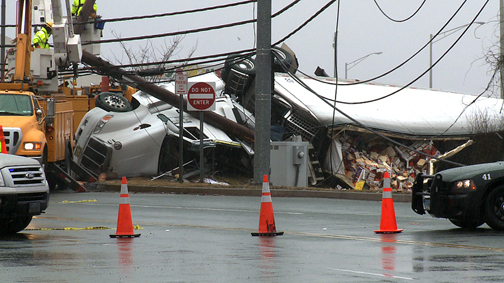 According to officials at Texaco’s Port Newark storage facility. 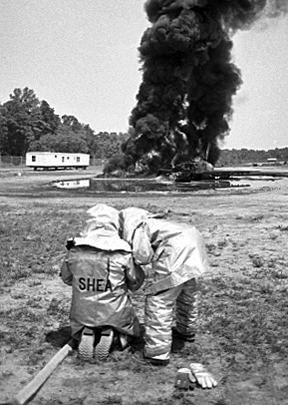 A fuel overflow drained into a moat, then vapors were ignited by a nearby drum manufacturing plant causing multiple explosions. 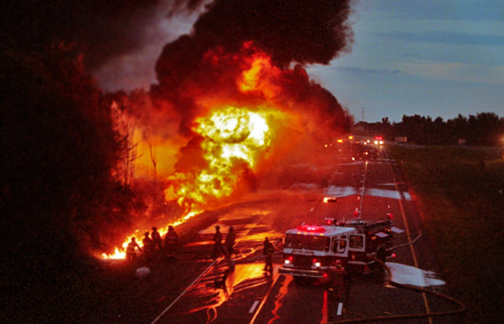 The blasts were felt as far away as Bridgeport, Connecticut. 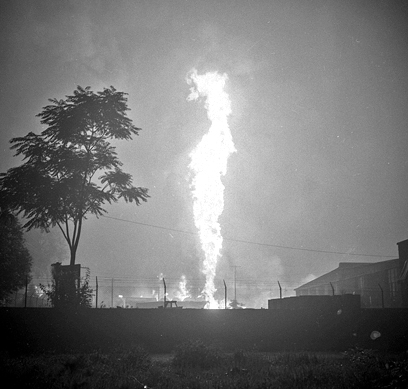 The fire raged on for three days before burning itself out. Here are some shots I found recently. Wow, a mere 27 years ago! 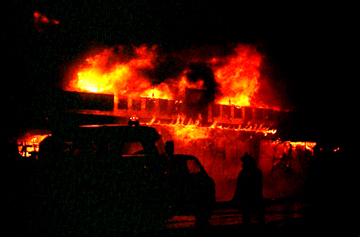 December 8, 2009 – 5 Alarm fire on George Street, East Hartford, Connecticut. 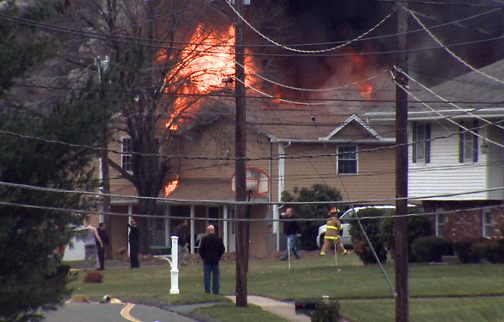 I finally had a chance to put together this video that I shot at the fire in East Hartford. Take a look. The first, and furthest back in my memory of photographing a fire was a big one. A real big one! 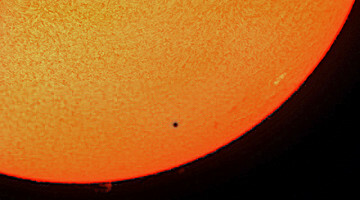 Seen from our house in Kensington (about 8 miles away), I remember it lighting up the whole northern horizon in red. 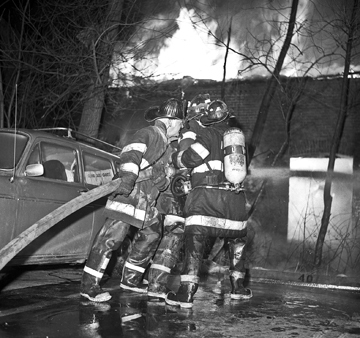 After recieving a frantic phone call from one of our relatives in New Britain telling us “the whole town seems to be burning” our family piled into our Oldsmobile and heading towards the flames that you can clearly see. My mother had the foresight to take her Kodak Brownie Camera with us to capture the event. On the edge of New Britain we were stopped around the old New Britain High School on South Main Street and walked as close as we could to the fire at the American Hardware Corporation. The huge factory building encompassed several city blocks and was about six stories high, and was located just off the south end of Main Street. 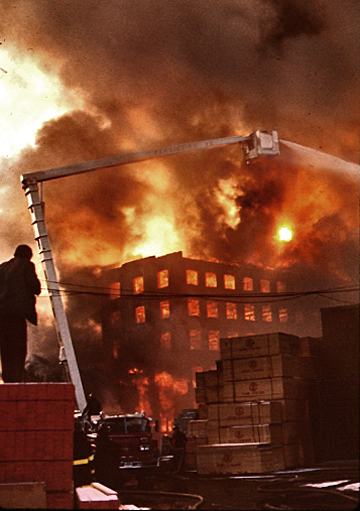 Thousands of people were in the streets watching the blaze as fire departments from all over central Connecticut were called in to fight this fire, and unknow to us at the time, a major fire at the New Britain Lumberyard was also burning. 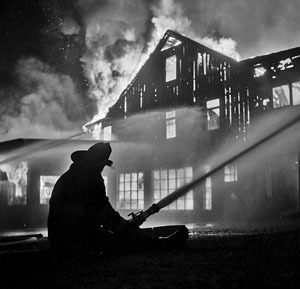 This is one of the photos that my mother took that night and got me started in fire photography. What a way to start. 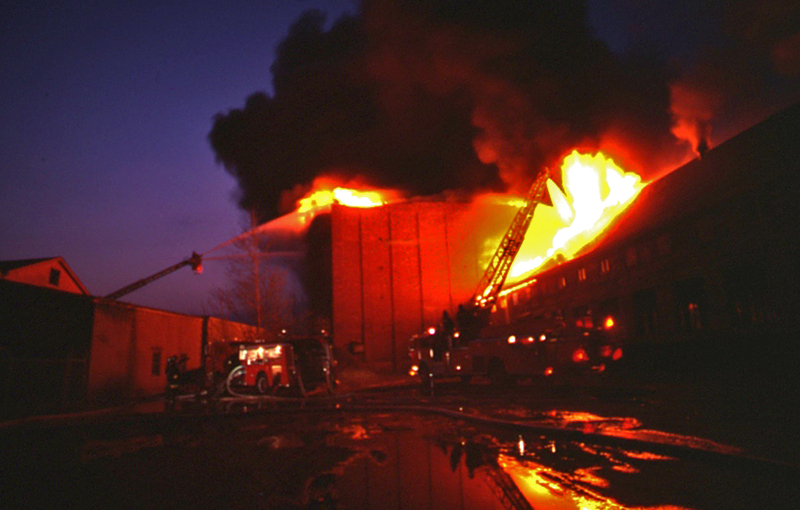 It all started that night with a first alarm assignment for the New Britain Lumberyard. 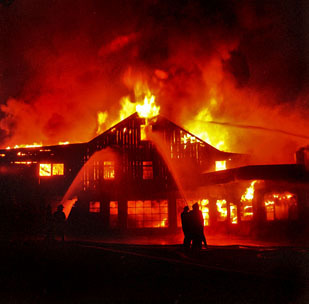 Firefighters found the lumberyard with heavy fire throughout, calling all of the cities fire companies to the scene. 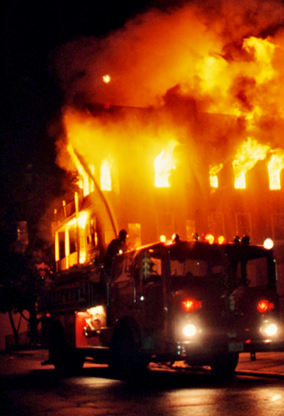 Shortly after, a second alarm came in for the American Hardware Corporation. 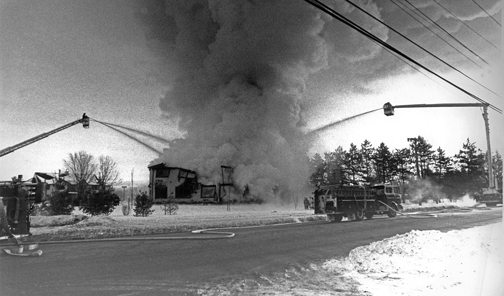 In the end, (twenty four hours later) twenty eight fire companies were called in to fight the fires from twenty surrounding towns. 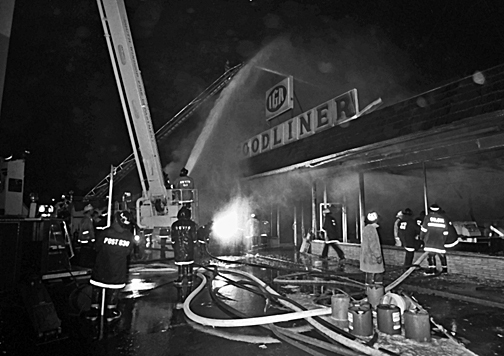 Here are a few photos of the New Britain Lumberyard fire from my collection, taken by my buddy photographer Roger Gaudio. 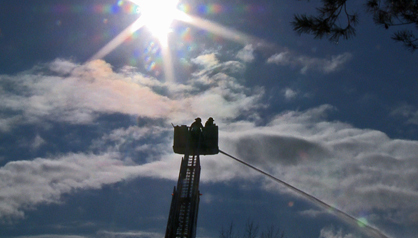 High above the fire, Newington’s new Snorkel Truck gets a workout in New Britain. keep them coming, i have started to scan my old B&W negs to see what i have. Sound good Jim. You never know what you might find! 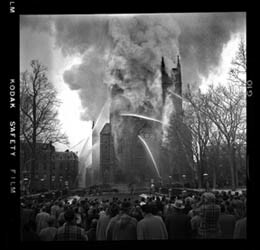 Nice job, the first Cathedral photo in an eerie way had amazing detail. Looking at the old photos just made my day. 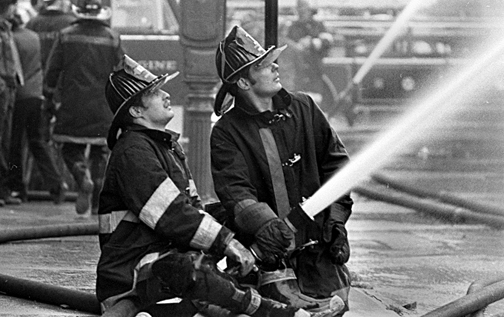 I really like old fire photos. 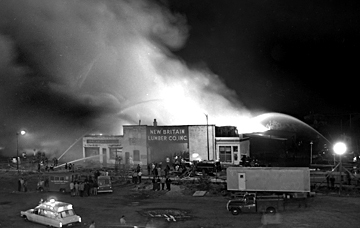 But seeing some photos of New Britian’s Night Of Fires Was just amazing to me as I grew up in New Britain. I think thats what also got me started in photographing fires. I was 10 at the time and only got to see the aftermath. 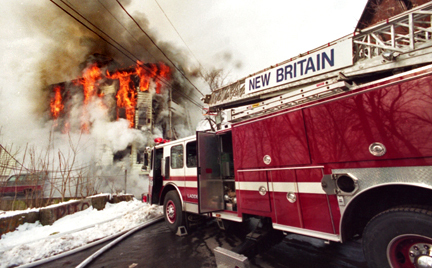 Alan, Thanks for sharing these great fire pics, especially the New Britain ones. A great website. 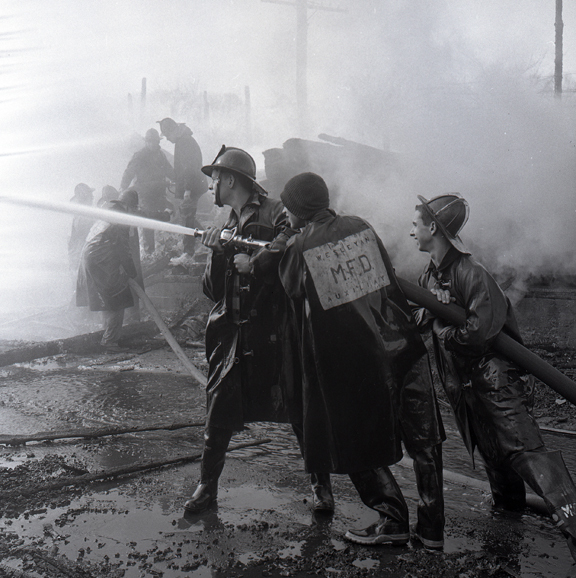 Middletown Lumberyard fire Feb. 19,1957.I’m the guy on the nozzle.Was in my second year at Wesleyan. A really cold day. Spent 13 hours at that one. Thanks for bringing back fond memories!! Great Job, My brother and I have been dooing family genealogy for the last couple of months. 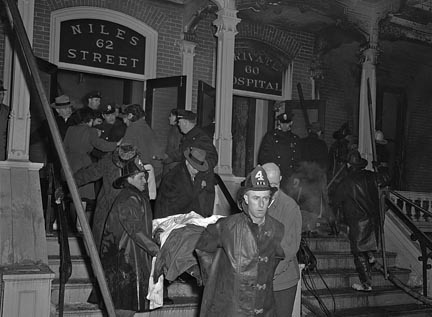 We discovered that my great aunt died in the Hartford Nile Street Hospital fire. She and my gradfather are mention in the newspaper at the time. Thanks for restoring the pics, it means a lot to me to see them. Thanks Again. 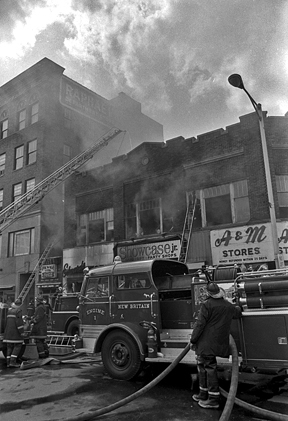 The photo’s of the general alarm fire on Main St. in New Britain from February 21 1972 was located between the Andrews and Rao buildings that is now a parking lot. There was a McDonalds located in that spot briefly at one time afterwards. I have no information about this fire other than it was an Oil Tank fire owned by the Crown Company. 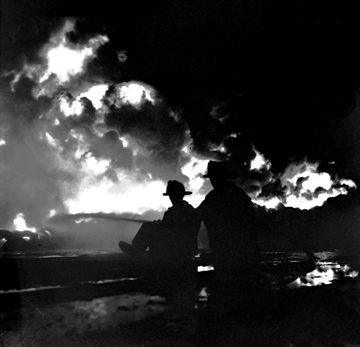 Probably on the Connecticut River over 50 years ago.This fire was at the valley oil company in portland,ct, in or around feb.-mar.1949 ,i was 7 at the time and we were dressed to leave the area because the tanks may explode,lucky the tanks were filled that day,fire depts.from hartford to new haven were there,i have some photos my father took after the fire.a few years later there was another simular fire on east st. in new haven. if your on the portland side of the bridge you’ll notice a mesh fenceing on the railing,put there after the fire ,it was thought that a cigarette thrown from a car started the fire. 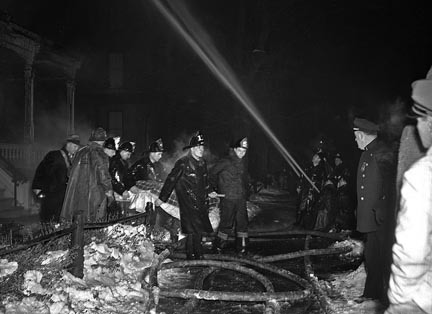 Re:your retouched photo of Lowenthal Lumber Fire(occurred on 2/19/1957).Related to your photos of Wesleyan Auxiliary members –same date. Fire came in at about 10:00AM. Very cold w/snow. Sounded General Alarm bringing in all off duty Middletown Fire Fighters and mutual aid from South District,Westfield and others. I was in my second year at Wesleyan and was the student Chief of the Wesleyan Aux. We spent a total of 13 hours at this incident and even during the next two days helped the regulars picking up and repacking hose. Hey “Moe Green” you always take great shots! Web site very nicely done! 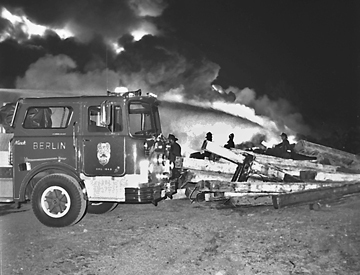 Feb. 19,1957 Lowenthal Lumber Co.
J. Franklyn Dunn was Incident Commander.This photo is related to above photos of Wesleyan Aux. members. Thank you for such awesome pics… great website. I love my CT, though I now reside in PA for approximately seven yrs… Some of these pics brought tears to my eyes, while others left me in awe. 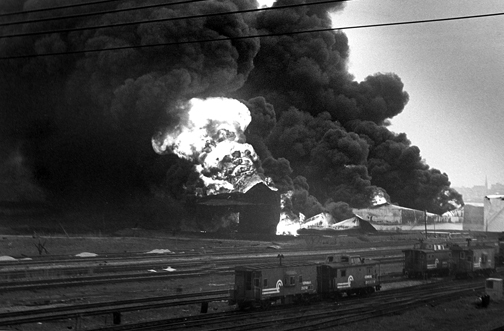 Interesting the one of the “Federal Express” train wreck. I am 43 years old, and recall vaguely hearing of it, so it’s great to hear and see what really happened. Thank you for your effort. Your passion truly shows through not only the pictures, but your comments as well. 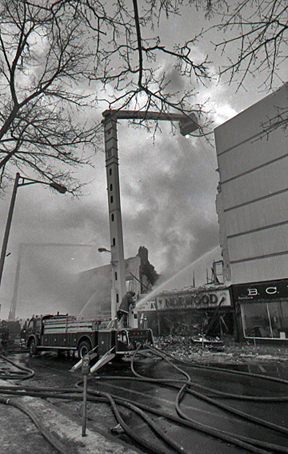 I was at the New Britain Norwood’s fire March 6 1972. The building was still standing when I was there and I do not think it had spread to the other building’s yet. Very thick smoke that could be seen for miles. My dad took me there when I was on school lunch break so we were not there too long. I’m almost sure we saw Plainville firefighter’s there also. Nice pictures Al. The one of the roof ops in New York is still on the wall at the Wolcott Fire School. 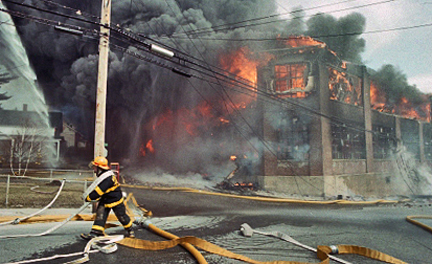 I remember the oil tank fire in Portland CT. I was 7 yrs old and lived directly across the River. We were awoken early in the morning by a explosion that shook the whole house. We went outside to see what happened and we could see and FEEL the flames all the way across the river every time the fire flared up. After the Sun came up it was still dark because of the black smoke until at least 9:00 am. I’ll never forget it, it almost seemed like a dream, until I saw your pictures. Thanks.